During financial crisis, you may approach a bank or non-banking financial company to help you out with availing credit. However, you must be very careful to authenticate the financial institution/lender, as today there are some who run scams on unsecured loans and credit systems. As personal loan is highly favourable as an unsecured form of borrowing, scammers often target people who are looking for this type of financing. Some come ahead with false promises without having any interest in lending you anything. Here are some of the common scamming ways fraudulent lenders can use to entice you into trusting them with your personal information or money. It is very important to know that no banker or genuine lender demands any fee to be paid in cash before disbursement of loan or agreement of the loan. Any call from the lender asking you for an advance fee may be a scam and is better to be ignored. However, do note that loan procedures applies certain fees such as processing fee, documentation verification fee etc, but all those fees would be agreed upon in the loan agreement, and cannot be just a matter of word of mouth. Phishing is a type of fraud, where your personal details are collected for the sole purpose of conning you. The fraudster acting as your well wisher promising you loans on very reasonable terms obtains your personal details like your name, bank account information, identity proof, credit card number etc. They may then use your personal details for opening of fake credit accounts in your name or hand over the same to financiers for a good tip. It is therefore necessary to ascertain the credentials of the lender asking for your personal details. The credit scores handled by the Credit Information Bureau (India) Ltd decide your qualification for obtaining a loan from any bank or financial institution. The credit score is determined by your financial credibility in the market and thus all loan applications are subjected to an elaborate scrutiny by the banker. If you are told by your banker that credit score is not needed for personal loan approval, then it may be a scam. Even if your credit score is poor or you do not have sufficient credit history, the lender would still want to check it, especially when it concerns unsecured loans such as personal loans. Fraudsters trying to steal your personal details may contact you through phone calls or e-mails stating that you qualify for obtaining a loan, without having to through the hassles of credit checks or other qualifying conditions. These people would try to get the maximum information from you like your personal details, credit history, or even ask you to submit copy of previous credit report etc without taking your consent or clear about their terms and conditions. So be wary of such unsolicited communications. Why Should You Trust Loanbaba.com for Personal Loan Online? 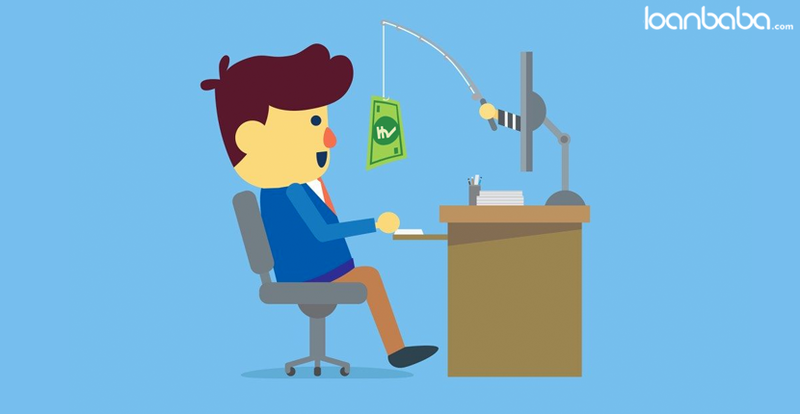 At loanbaba.com, you can get loan safely, because we do not practise any of the mentioned scamming methods or any other fraudulent activities. We apply no hidden costs or fee for the service we render. You can apply for personal loan with us at no additional cost. Also, when our customer representative contacts you, he/she will never demand critical information such as credit card or debit card number and details or email password and other such sensitive information. We help you connect with banks and NBFCs, so that you can get the loan from anywhere in India, without having to visit the financial institution. For verifying details, the customer representative may just enquire about factors related to eligibility criteria of the loan applied for, but not any other information. Any details shared will be utilized for the loan product or service purpose only, after taking your consent. When applying online or via an agent for any personal loan, keep in mind the above-mentioned pointers.